Derek Dahl and Sam Buss give a classic Nordic lawn game a tabletop twist with this handmade mini version. The inkastare's just tossed a new field kubb. Make sure your kastpinnar doesn't hit the king, or it's game over. Skol! You're playing kubb, also known as Viking chess. 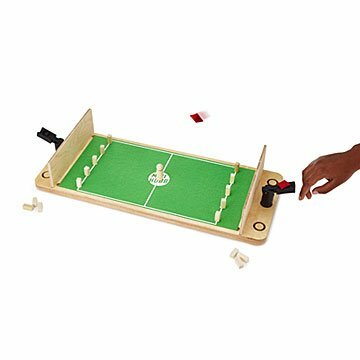 While it traditionally takes place on a field, this miniature wooden version of the Nordic lawn game lets you take turns knocking down those blocks right on your tabletop. The game originated in Sweden, but eventually made its way to the Midwestern US, where makers Derek Dahl and Sam Buss noticed its popularity among Minnesotans. Their mini version comes complete with kubbs (pronounced koobs, Swedish for blocks), kastpinnar (traditionally batons, in this case blocks), an adorable itty bitty bean bag (to mark where to place kubbs), and a king (knock him down at the end and you win, too soon and you lose). It also has pivoting launchers for precise aiming and removable backboards to keep blocks on the felt-covered playing surface. We've heard kubb described as "horseshoes meets bowling," but we prefer to describe it as roligt (That's Swedish for fun!). Handmade in Minneapolis.